Renew your face in 30 seconds! Effective, results-oriented grooming and more. The simplest and quickest way to improve your complexion and prepare for shaving. This unique formula with professional biological exfoliators (3% Glycolic, 1% Salicylic) and microbuffers is gentle and highly effective. Dissolves dead cells and organic build up that make skin look dull and lifeless to reveal a smooth and healthy looking complexion. Aloe Vera and Allantoin soften and soothe. Exfoliates the top layers of the skin, diminishing fine lines and rough areas. Newer skin cells and a more even skin tone are revealed. Improves shaving comfort and results. Good product, very fine scrub which is what I like BUT full of plastic. So won't be buying anymore. I'm sorry but there must be something companies can use in their products instead of micro beads! So moved over to another product. Just check for Polyethylene in the ingredient list if anyone is actialluy bothered about not eating this stuff once it goes full circle! I really like this brand. It really soften and clean my face. It's effective to me. Also, thanks to mankind.co.uk. for keeping this brand. I had great expectations of this, the reviews previously posted promised much. However, I was disappointed with it overall - it performs okay but not better than any other scrub half the price - this is very expensive for what it is. The smell, yes it DOES have one, is horrible! It's hard to describe, it's certainly not perfumed or a deliberate fragrance but it smells like an old musty room with a nice chemical thrown in. I prefer Jack Black or Lab Series scrubs to this. I've tried a fair few face washes and this is by far the best. fresh, clean feeling even after a year of twice-daily use. 5 stars hands down. I love this product! Although it is more expensive than some, it has really fine abrasives so you get a really good level of exfoliation without feeling like you've scratched half your face off! It lasts really well too! One note, though: the Menscience products do have a warning to take additional care if you're going to be spending a long time in direct sunlight as your skin's sensitivity to the sun can increase after usage. Take heed - I got a touch of sun burn after ignoring their advice! Great product though! Best facial scrub I've used - a little goes a long way. 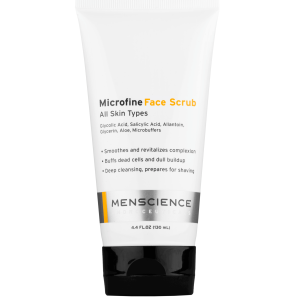 Microfine Face Scrub is perfect for using prior to shaving. One of the best Menscience products along with the Advanced face Lotion. Leaves face soft, clear and clean. Will be buying more. This scrub is fantastic. Scrub for 2-3 minutes and your skin will feel smooth like a new born baby's. 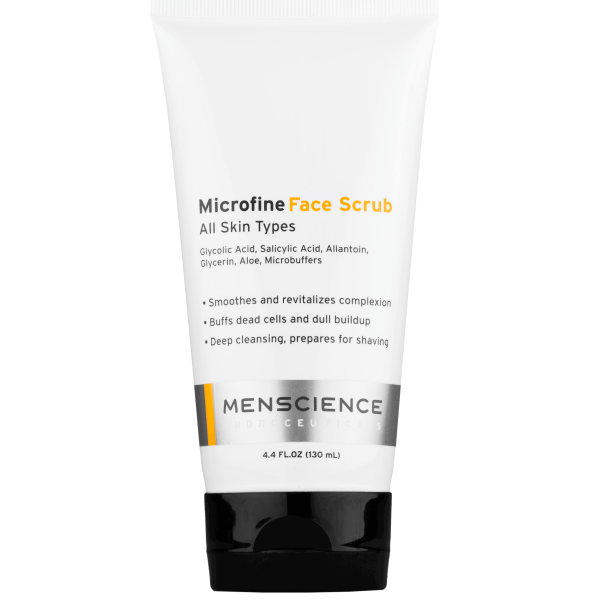 I've tried scrubs from many top brands and am extremely impressed with menscience. It thoroughly but gently exfoliates, both chemically (AHA/BHA) and mechanically, and leaves skin ultra smooth and bright. It also significantly improves shaving comfort. Its by far the best in my experience. I don't think I've ever been so impressed with a face scrub before. I'm a youngster and my skin is pretty supple, but no redness or drying out from the scrub. Beats high street brands by a country mile, however, I don't have any other premium brand to compare to. Then again, perhaps I don't need to compare it since it works so well for me! Got this with a face kit, and it's incredible. My girlfriend is even using it now. I used it for the first time this morning in combination with the Peter Thomas Roth Facial wash and my skin is looking amazing. Slight problem is the bottle isn't that big given its price, but it works so I don't care about that much. Just the best face scrub out there period. I have tried many brands and up until now the best was my wife's face scrub. However this is a lot better than that and after letting my wife use it once she agreed. This is fantastic. It leaves you skin look renewed and 100 times brighter after each use. Highly recommended. Great Product & Great Value for Money! Really sorts out congested skin, trapped hairs, poor complexion. I use it before shaving as a prep. You can really feel it scrubbing your face clean, removing excess oils, and preparing your skin for shaving! I have normal to oily skin which is prone to redness. Therefore I scrub for about 30 seconds to avoid any irritation. Results are a nice close shave with NO ingrown hairs, and a nice buffed and bright complexion. Good stuff! Brilliant, tremendous results (for me and her), good value, long lasting. Buy some and see for yourself.